Explosions do not happen by accident. By definition an explosion is a sudden and violent event. In many cases, those working nearby have no time to react and protect themselves from injury. Often the physical consequences are unusual and severe. Whether explosions happen on a construction site, a refinery, at work, or at home, the force of the blast can cause the types of injuries more frequently seen on a battlefield than an emergency room. Depending upon whether the explosion involves fire, gas, electricity, chemicals, toxic substances, or heated liquids, victims may be burned or wounded, may have lung or eye injuries, may be poisoned, or may be at risk for future ailments due to exposures to substances that are known to be carcinogenic. Explosions rarely happen by accident – they usually occur due to someone’s negligence. 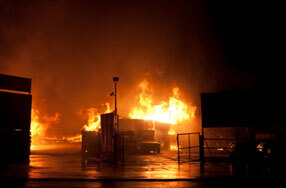 Explosions may be caused by negligent installation, maintenance, repair, or operation of equipment. Explosions may be caused by the negligent failure to inspect for contain leaks. Explosions may be caused by negligently designed or constructed equipment. Explosions may be caused by the negligent failure to adequately respond to minor electrical and/or fire problems that spread into the vicinity of sensitive equipment, which in turns leads to a much larger problem – an explosion. If you, a friend or a family member has been injured in an explosion, you should consult with an experienced personal injury lawyer who knows how to conduct a detailed factual investigation concerning exactly what happened and why. At minimum, this will require making public records requests to obtain the witness statements, narrative reports, investigation memoranda, and citations generated by any governmental entities that were called to the scene of the explosion right after it happened, including but not limited to police agencies, fire departments, and state or federal safety officials charged with enforcing the Washington Industrial Safety and Health Act or the Occupational Safety and Health Act. Additionally, an experienced personal injury lawyer will likely retain a consulting expert witness who is qualified to offer advice and opinions concerning the specific type of equipment and substances involved in the explosion. Only then can an experienced personal injury lawyer determine whether a negligence or product liability claim can be brought. Ammonium nitrate and explosives magazines. We are a Seattle-based law firm, but we represent injury victims from all over the state, in every county and federal court in Washington. If you hire Kraft Davies, PLLC, you will pay us no fee unless we win financial compensation for you!